Winter is a time for looking at plants. Before the brouhaha of Spring, with its glut of seeds to be sown, weeds to be hoed and beds to be tidied, there is a brief pause when we can quietly appreciate the beauty of plants. There are few flowers around at this time of year but all of them repay close study, even if this does involve muddy knees and a sore back. You need to crawl around to examine the complexity of snowdrops, and bend double to appreciate the exquisite flowers of hellebores. The pools of dwarf irises that are just beginning to flower are impressive from a distance, but it is only close up that they really delight the eye. 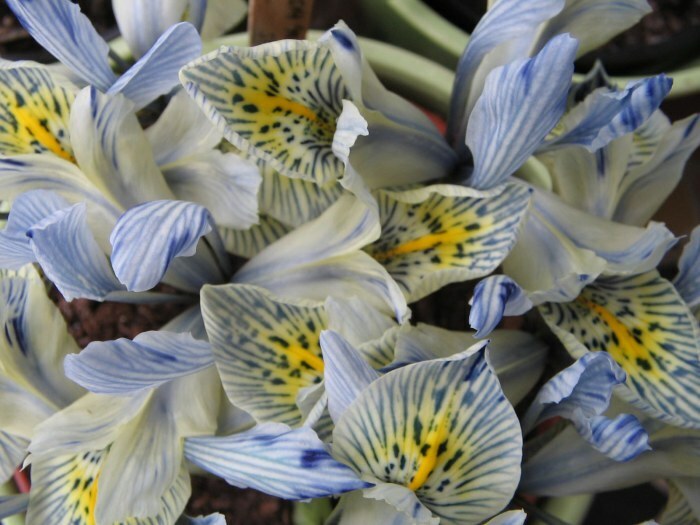 Look closely at the flower of the queen of the dwarf irises, Iris ‘Katherine Hodgkin’, and you will see complex and intriguing patterns that resemble a doctor’s inkblot test. Against the cool pale blue of the petals, darker veins merge into yellow stains and random spotting. This could be the lip of an orchid or the camouflage of an exotic butterfly. Neither Fabergé nor a Meissen painter could fashion anything as beautiful as this: it could only be a creation of Nature. On this occasion, though, nature has been helped by the hand of man, in the form of plantsman and writer E B Anderson. In the early 1960s Anderson crossed two rare irises, I. wiogradowii and I. histriodes, collecting the pollen of the first and storing it in an empty jam jar until the second iris flowered. Most of the resulting seedlings would no doubt have been miserable plants, but one, which he named after the wife of fellow plant-enthusiast Eliot Hodgkin, was a treasure. Such a success is a combination of patience, good luck, hard work and knowing what you are doing. Most of all though, it needs the eye of an artist: Anderson knew that the progeny of these unassuming parents might well produce a plant of special beauty that would enchant gardeners for decades to come. Anderson and Hodgkin were part of a group of amateur gardeners and plant enthusiasts who collected and bred plants during the 1940s, 50s and 60s. They shared their knowledge and enthusiasm as freely as they did their plants. 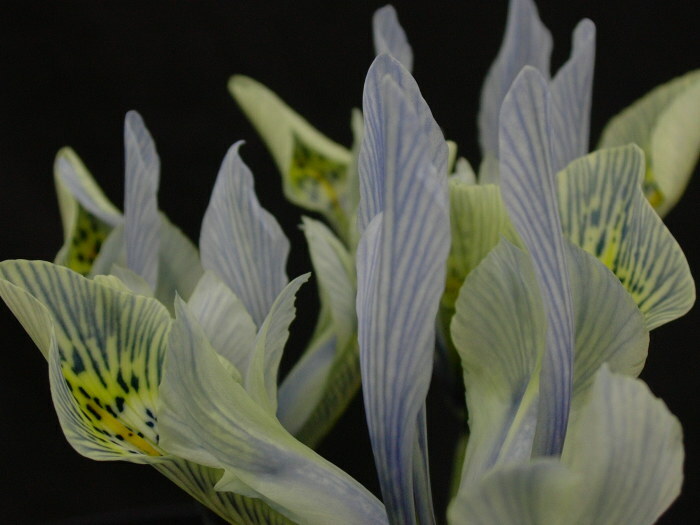 Anderson passed Iris ‘Katherine Hodgkin’ to friends and nurseries, who grew it on and who, in turn, shared it with other appreciative gardeners, until its beauty became available to everyone. I first saw it as a single flowering bulb in a yoghurt pot on a charity plant-stall. To grow plants like this is to connect to a thread that winds back through generous and passionate gardeners to E B Anderson himself and to the heyday of British amateur plant breeding. If this little beauty were to appear today she would have been patented and copyrighted, controlled and marketed by international plant producers quicker than you can say ‘Iris’. Grow ‘Katherine Hodgkin’ for her beauty, but also for her link to a more gentle time, to generous gardeners and passionate plantsmen. All the dwarf iris are easy to grow, but to have any hope of producing healthy plants you need to start with healthy bulbs. As with all bulbs, fat and firm is the rule. Avoid bulbs that are shrivelled and desiccated or soft and squashy. The ideal growing conditions are in a well-drained soil in either an open, sunny position or under the canopy of deciduous shrubs. This will keep the bulbs dry during the summer, which is essential if they are to spread out into large colonies. Plant the bulbs about 8-10 cm deep. If your soil is heavy and wet the bulbs will either rot during their first year or slowly weaken over a number of years until they fade away completely. The only way to have a lots of flowers in these conditions is to plant new bulbs each autumn, as you would tulips. Bulbs are very cheap and you can have an eye-catching display for just a few pounds.